In 1941, the first Jeeps went into production specifically for the military. Known as the Willys MB, the first vehicles rolled out of Toledo and into war. Amazingly functional and durable, it became the primary light four-wheel-drive vehicle of the U.S. Army and the Allies throughout World War II. Four years later, the first civilian models were produced, and the public fell in love. It became the first sport utility vehicle as we know them today. Though ownership has changed, strength and utility have remained a deep tradition, inspiring a brand loyalty that no other vehicle can match. Trust us, we know. We talk to dozens of Jeep drivers daily, and they all share the same love of their Jeep, whether it's a Spartan Wrangler or a sophisticated Grand Cherokee. When the company celebrated its 70th anniversary in 2011, drivers celebrated. You can join that party with our 70th anniversary spare tire cover. 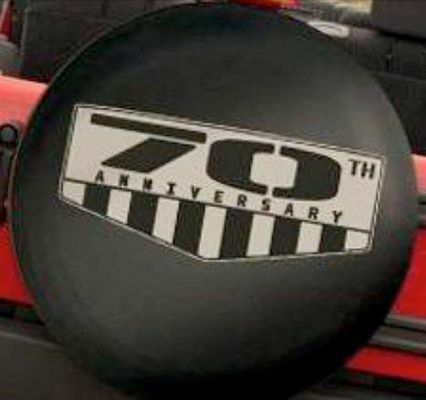 It's made by OEM Mopar, so it features the exact same logo released in 2011, and it is displayed on a black denim cover with heavy duty stitching - that means it will protect your spare well past Jeep's 80th anniversary in 2021.